The last decade has been marked by change for Syracuse. The shift from perennial contender to championship afterthought, and of course, the leap from the Big East Conference to the ACC. Here is a recap of that past decade of Syracuse Orange basketball (2006 – 2016). Point guard is an extremely vital position in all of basketball, but especially in the college game. Jonny Flynn was an all-around talent for the Orange, distributing six assists and scoring 17 per game in his two years at the college level. I chose Flynn over Michael Carter-Williams because Flynn had a stronger all-around game. Devendorf could flat-out shoot. In my opinion, he was the best pure shooter to suit up for Syracuse since Gerry McNamara. His only competition for this distinction was Andy Rations. Rautins was also a pure shooter, but he did not score at the rate that Devenforf did. Carmelo Anthony is by far the best small forward in Syracuse history. Since his departure after the 2002-2003 season, small forward had not been a strength for the Orange prior to Fair’s arrival on campus. Fair was a 2-year starter and averaged over 26 minutes per game for three years. This choice was not necessarily based solely on stats and stardom, but rather on dependability and continuity. It is a rarity in this age of one-and-done players to see an athlete spend four years in college. C.J. Fair provided Syracuse with veteran leadership and steady production throughout his entire career. Christmas made a name for himself his senior season. He averaged 18 PPG while playing 35 minutes a game in his final year in an Orange uniform. Christmas, at 6’9″, provided length on the interior of that devastating 2-3 zone that has become a stalwart of head coach Jim Boeheim’s tenure at Syracuse. Christmas was also a very efficient shooter throughout his career, shooting 56% from the field over his four years. Simply put, he was the only true center that Syracuse had in the last decade. At a position that’s importance has been declining over the past 20 years, it is rare to see a true center thrive in a college offense. Fab Melo certainly did not make anyone think he was a star. His time at Syracuse was largely underwhelming, averaging just five points per game in two years. His career abruptly ended when he was ruled ineligible immediately after the seeding was announced for the 2012 NCAA Tournament. There they are. Not a flashy lineup. Certainly no NBA stars in this lineup. Overall, this lineup could compete for an ACC title, and possibly make a deep run in the NCAA Tournament. Syracuse fans will always remember the six overtime game against UCONN on March 12th, 2009. This game was broadcast on ESPN. It was a quarterfinal matchup in one of the last Big East Tournament’s Syracuse was involved in. And oh-by-the-way, it was also played at one of the most famous arenas in all of sports—Madison Square Garden in New York City. This was all a recipe for one of the most exciting games in recent college basketball memory. Third-ranked UCONN took a three point lead into the half, while 18th ranked Syracuse rallied and held a 2 point lead with 27 seconds left in regulation, only to relinquish a game-tying layup to Kemba Walker with four seconds on the clock. The first five overtimes were neck and neck. Syracuse never led during any of those overtimes, but somehow pulled to a tie at the end of every period. Jonny Flynn had played 62 out of a possible 65 minutes heading into the sixth and final overtime session. He summoned the strength to score four key points and dish out an assist to teammate Andy Rautins in the deciding five minutes. In 67 total minutes, Flynn scored 34 points, recorded 11 assists, and also registered six steals in what became his signature game in an Orange uniform. Syracuse’s run ended in the finals of the Big East tournament, where they lost 76-66 to Louisville, who eventually made it to the Elite Eight in the NCAA Tournament. The 2010-11 Syracuse team was supposed to be the school’s best chance at a championship since the 2002-03 national title year. The season, however, ended in heartbreak as Syracuse was upset by Marquette in the NCAA Tournament Round of 32. After handling Indiana State in the first round, Syracuse lost to Marquette on a controversial call, leading to a turnover, and a game-winning three-pointer by Darius Johnson-Odom with 27 seconds left, crushing the Orange’ title hopes. The 2012-13 season was certainly memorable for Syracuse fans. The team compiled a 30-10 record, made it all the way to the Big East Tournament final game while in their last season as a member of the conference, and earned a 4-seed in the 2013 tournament. They tore through the tournament, even defeating #1 seed Indiana in the Sweet 16, before losing in the Final Four to eventual runner-up Michigan, 61-56. 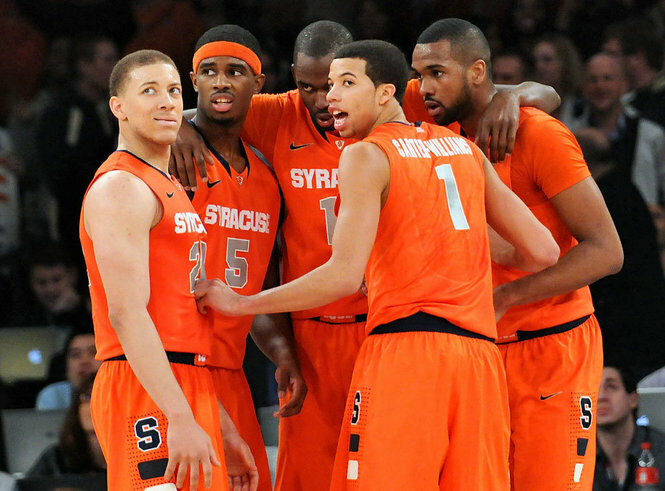 The 2007-08 season saw the Orange earn just 21 wins, matching their lowest win total in the previous decade. The team did not receive a bid to the NCAA Tournament after winning only 9 conference games, and losing in the quarterfinals of both the Big East Tournament and the NIT. This was not exactly a clear-cut choice. My top three candidates were Jonny Flynn, Eric Devendorf and Andy Rations. However, in the end, I had to chose Devendorf because of his ability to stretch the floor, and his versatility to play both guard positions. 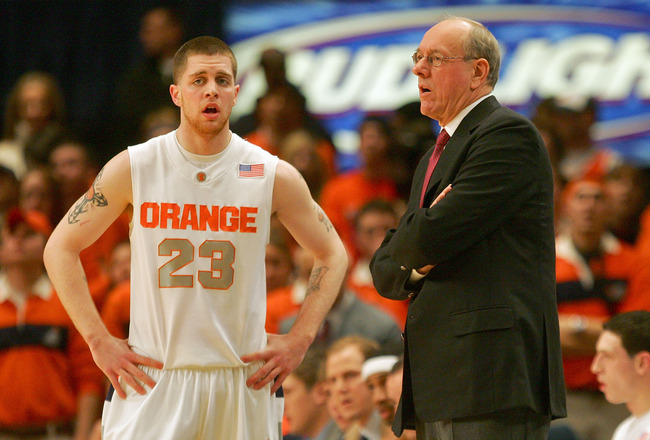 Often drawing comparisons to skilled shooter Gerry McNamara, Devendorf averaged 15 PPG, shot 44% from the field and 38% from beyond the arc in his four years under Jim Boeheim’s tutelage. This name might surprise you if you follow Syracuse basketball. Paul Harris, on paper, had an above average three-year career for the Orange, averaging 12 points per game during his tenure. Not exactly disappointing. But it was not what you would expect out of a McDonald’s High School All-American. Harris jumped ship after his junior season, only to go undrafted in the 2009 NBA Draft, and is currently playing overseas in Turkey. Certainly not what anyone expected when he signed his national letter of intent with Syracuse. For the past 50 years or so, the same man has been on the sideline for the Syracuse Orange. Boeheim, who became an assistant in 1969 and a head coach in 1976, has spent his entire coaching career at his alma mater. He has guided the team to three Big East tournament crowns, four Final Fours, and a National Championship in his 39 years at the helm. He also been named Big East Coach of the Year four times in his tenure. In November of 2011, two former ball-boys accused long-time assistant coach Bernie Fine of molesting them from the late 1970s, when he began his coaching career, to the early 1990s. Fine had been an assistant coach from 1976 until he was accused. Since the accusations, he has been placed on administrative leave. Dion Waiters, while not a bona fide star in the NBA, was my decision because he has been the most productive Syracuse alum since Carmelo Anthony. Since being drafted 4th overall by Cleveland in 2012, Waters has averaged 13.1 PPG in his three and a half year career. Waters should be able to sustain a long career in the NBA because of his ability to score and shoot the three-pointer.